"My experience — and most architects would concur with this — is that the best projects come from a crappy budget, a challenging schedule, a difficult-if-not-impossible client, and a really bad site. That makes you take your game to the highest level." Edward Kuharski is an accomplished architect who has worked in the trenches of great projects for many years. Among Mr Kuharski's credits, "...on-site architect for the construction of American Players Theatre (APT) in 1980. He spent 28 years at Marshall Erdman & Associates in Madison, then founded Green Design Studio in 2009." Mr Kuharski was recently hired by the nonprofit group Occupy Madison to design the site for the village of “tiny houses” for the homeless, the first such effort integrating this kind of project into a neighborhood setting anywhere in the country, maybe the world. There is a link below to a good recent article about Mr. Kuharski's contributions to the tiny houses project, and where I'm sourcing these quotes. I like his honesty about turning challenges into opportunities to do your best work. No startup launches under ideal conditions. Start. Adapt. Find higher ground. Repeat. My favorite quote from the piece is about the village of 'tiny houses' he helped plan and develop: "I like to refer to it as Dane County’s third gated community. We decided to skip the golf course." 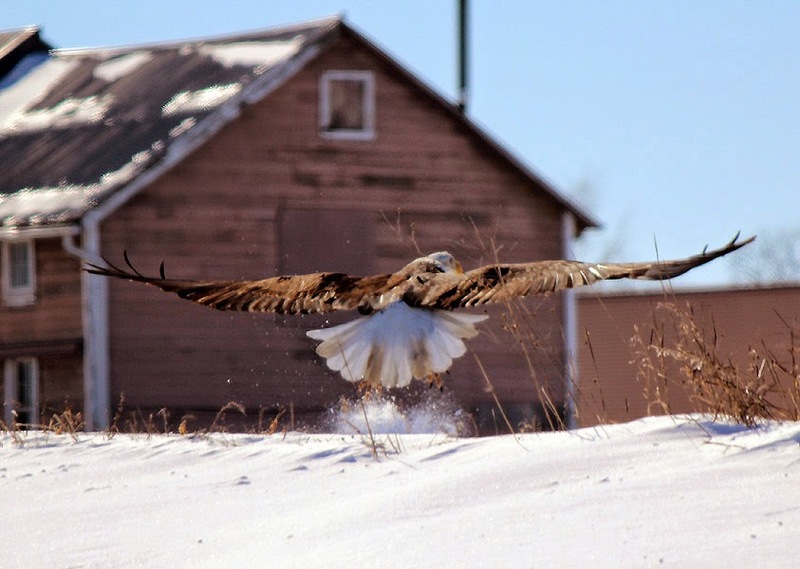 Photo is a Bald Eagle taking off from a farm field in Columbia County, WI.